Tag Archives for " Sponsored Stories "
As the importance of Facebook as small business marketing tool continues to grow it’s important to adapt your marketing behavior in ways that allow you to gain practical benefits from the way people are choosing to use social media. Some business owners still struggle trying to learn what some might call Facebook marketing, but the key is to change the way you approach it. To me there’s no such thing really as social media marketing or Facebook marketing, it’s simply a matter of marketing in a world gone social. Below are five practices that make up my current thinking on getting the most from your marketing presence on Facebook. 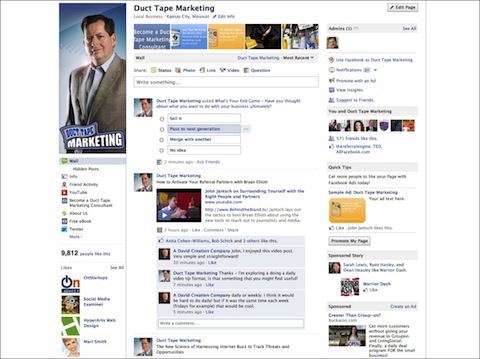 Lots of companies out there want to provide apps for Facebook tabs and interactive welcome pages, but you must understand that the way people actually view your presence on Facebook is different than on, say, your Web site. What this means is that you must commit to making your Wall and your status updates frequent, human and compelling. Apps and contests and campaigns to get more Likes are all fine, but the real payoff is at the wall. Commit to making that an active place where people comment and engage and you’ll get more from everything you do on Facebook. It’s kind of ironic how little traditional networking goes on inside many social networks. Sure, people converse with their friends and fans, but the real power of understanding how to network lies in reaching out to people you don’t already know and finding common ground to expand your network. One very powerful way to do this on Facebook is to Like other active pages and start to network with, converse, ask and answer relevant questions as your Page inside of these communities. It’s a bit like the tactic of making relevant comments on numerous blogs, it often leads to new groups of people finding and joining your page or blog. Understand, I’m not talking about spamming a bunch of other pages just to get noticed, that kind of things won’t payoff and may even backfire. I’m talking about identifying Pages that might have communities you could target and taking a few minutes each day to get active there. People are people and it doesn’t seem to matter if you are in a gas station needing directions or on Facebook wanting an answer – people respond when they are asked a question or asked to take an action. One of the most powerful things you can do to create more engagement on your Page is to ask for it. Ask stimulating questions, ask for opinions, ask for suggestions, get things critiqued, ask for more comments, ask for more Likes, ask people to spread the word about something – all of these asks, when used wisely and sparingly, will produce immediate engagement and can lead to great conversation and content starters. If every one of your status updates is simply a notification that you have a new blog post, you’ll find some people that like to read your blog reacting, but little else. It’s okay to add your blog posts, but real engagement comes much faster when you mix your content up and give people lots of stuff they can react to without leaving their news stream. A two-minute YouTube video can be embedded as a status update by pasting the link and now people can view, Like and comment without leaving their news stream. Same thing for a stimulating question or Poll. These are the kinds of things that make your Wall more vibrant and make people look for your updates. I like the Facebook ad platform, primarily because you can target so well. You can get to the point where perhaps 4000-5000 of the right people on Facebook are the only ones viewing your ad. 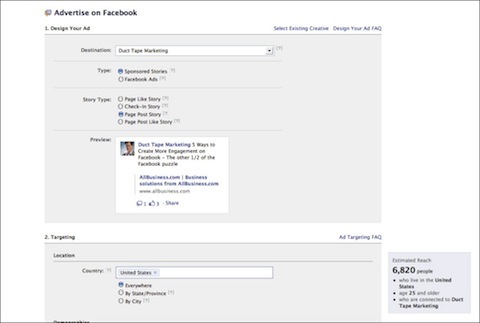 This can really make Facebook ads cost effective. However, ads are ads and even the most engaging ones are easy to ignore after a while. Enter a new ad unit called Sponsored Stories. The Sponsored Stories option, found in your ads dashboard, allows you to show your latest status update in the right sidebar of pages of your Fans. This is significant because the update stays there all day long, while your actual update may fall off the page in a matter of minutes on a very active page. You can also simply put out a call to Like your page through this option. I’ve seen indications of this unit outperforming ads by four times. In addition, I believe using targeted advertising to gain Likes of people that might actually be interested in what your brand has to say is probably much more effective long term than harassing your high school friends to Like your page.